The Gold Coast is a smorgasbord of accommodation options and choosing where to stay can sometimes seem overwhelming. This list of top 10 Gold Coast hotels, resorts and apartments has been handpicked by our expert consultants for their winning combination of location, quality, facilities and affordability. 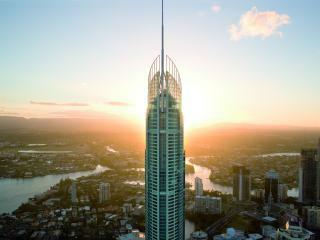 The Gold Coast's newest resort and attraction, Q1 Resort & Spa offers 80 levels of luxury modern apartment accommodation. Centrally located in Surfers Paradise, the beachside resort enjoys premier facilities and the attraction of an observation deck offering 360 degree views of the coast. For 24 hour excitement and accommodation that never sleeps, The Star Gold Coast offers recently refurbished stylish accommodation just metres from the beach and Broadbeach precinct. A fantastic range of facilities combined with an onsite casino, bars, restaurants and nightly entertainment makes The Star Gold Coast very popular. Australia's premier theme park resort, Seaworld Resort & Water Park is ideal for families and is located in Southport, just a short drive from Main Beach. Offering comfortable accommodation and an excellent range of facilities, the resort adjoins the Sea World theme park putting you in the heart of the action. QT Gold Coast is an intriguing, creative and funky destination in the heart of Surfers Paradise. A Unique beachside design, quirky furnishings and the famous Bazaar Interactive Marketplace Restaurant, QT Gold Coast is ideal Gold Coast accommodation for an exciting beach getaway. Features include heated outdoor pool and spa, tennis courts, bicycle use, day spa, café, gym, restaurants and bars. Perfectly positioned in the heart of Surfers Paradise, the luxury apartment accommodation of Mantra Towers of Chevron is just metres from the beach and the shopping and nightlife of Cavill Avenue. The resort is also renowned for its 1.25 acre recreation area complete with pool, bridges, grotto spa and more. Ideal for shopaholics or those who love the nightlife, Mantra Circle on Cavill offers stylish beachside accommodation surrounded by the boutique shopping, excellent dining, vibrant nightlife and tourist attractions of Cavill Avenue. The apartments are also family friendly and nice and close to the beach. Ideal for a relaxing beachside holiday, Novotel Surfers Paradise offers comfortable and affordable accommodation surrounded by some of the Gold Coast's best shopping, dining, entertainment and attractions. Enjoying direct beach access, the resort is a favourite with families. The ultimate luxury holiday experience, Peppers Soul Surfers Paradise offers deluxe apartment style accommodation spread across a 77 level tower. Located in the Soul Building, the resort boasts an excellent onsite restaurant - Seaduction, as well as a great range of facilities and beachfront location. Conveniently located just metres from the beach and a short stroll from Cavill Avenue, Mantra Legends offers deluxe accommodation in central Surfers Paradise. Boasting spectacular views of the ocean, hinterland and city lights, the resort is surrounded by outstanding shopping and dining options. The shopping, dining, action and attractions of Surfers Paradise are at your doorstep at the opulent accommodation of Breakfree Moroccan. With an impressive range of onsite facilities and a tropical oasis atmosphere, the resort is just a short stroll from Cavill Avenue and footsteps from the beach.